Munich The Man Who Said No! Tenth for the category labelled Crime thriller mystery action and adventure and 16th for suspense..
Had a massive five-day giveaway on Amazon when I achieved second place in the rankings, and now sales have been progressing well at 99p. 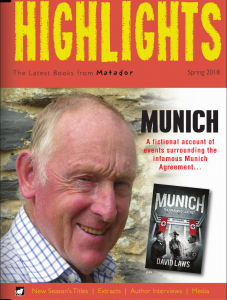 The paperback version of the book is now in the shops and I’m engaged on a programme of book signings at bookshops (see list on the Home Page of when and where) and also in libraries where I’m also continuing to do signings for Munich as well as Exit Day. Churchill – war leader, benevolent imperialist, big spender, serious gambler, risk-taker, debtor, tax avoider. The many layers of this fascinating personality that spawned a thousand biographies, a giant who dwarfs the minnow leaders of today. These were just some of the revealing insights to be gained at the weekend’s highly entertaining Literary Festival in Lavenham in Suffolk. The Churchill discussion featured biographers David Lough (the money) and Laurence James (the empire). Better than any TV programme. I can’t wait to read the books: how the great man beat the pants off the taxman and made the Paradise Papers dodgers look like children at play. A man several times massively broke, you just couldn’t knock him down. Throw in references to Trump and Boris and, for me, this was the stellar session of the festival. Some great warm-ups: Clare Mulley’s intriguing researches into two leading women aviators who flew for Hitler. Not just flyers but engineers and daredevil test pilots (like flying into barrage balloon cables with razor-cutting tips to their wings). One a Nazi, the other half Jewish who used her fame to protect her family. A fascinating look at the other side of the divide that coincides with the death last week of Joy Lofthouse, the last of Britain’s female ferry pilots. Continuing a war theme on Friday was an officer’s journey from Eton to Ypres by grandson Charles Abel-Smith. Very much the establishment story, probably interesting for what it didn’t say. Contrasted sharply with highly critical takes on WW1 from two other stories I’ve enjoyed in the last few days: Ken Follett’s Fall of Giants and RC Sherriff’s Journey’s End. Robert Harris is making a big publicity splash with the launch of his novel on Munich and the pre-war Appeasement crisis. 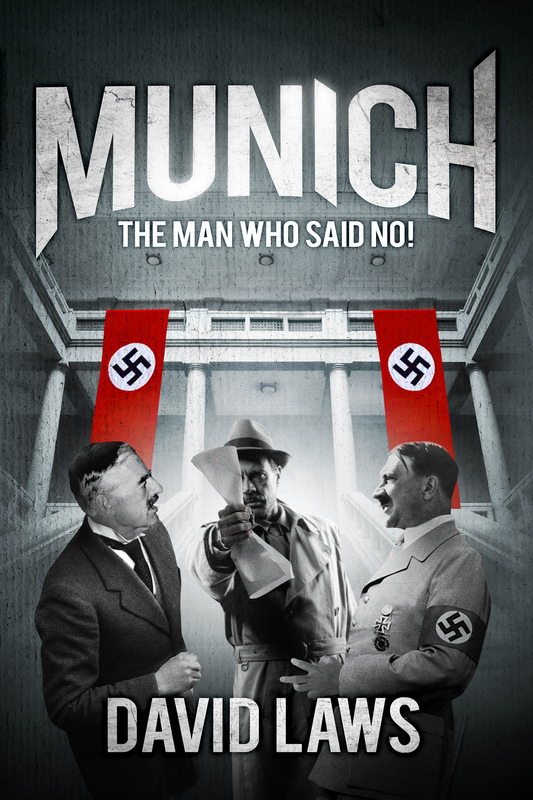 He has a great fanfare on the Tube and on the radio – but my novel MUNICH The Man Who Said No! is already out there on Amazon. What’s fascinating is that he’s trying to restore the tarnished reputation of British Prime Minister Neville Chamberlain – while I’m trashing it. His version of events appeared in a recent newspaper article headlined “Chamberlain’s Finest Hour”. The man has to be joking! Rival stories going head to head… a gulf in historical view… should make for lively reading. Britain 2019: An assassin stalks the Prime Minister about to sign the final Brexit deal. The country lurches from crisis to crisis as deadline midnight approaches on March 31st. Meanwhile journalist Harry Topp is chasing a spy at the heart of government… blissfully unaware he has a cuckoo in his nest. A friend, Tim Mobbs, gave me two flights and lots of wonderful detailed background information on piloting his bright-red Jodel, a light aircraft built to a French design by a group of enthusiasts in Germany in the Fifties. One of them had a clutch of “kills” in the war. “Are you feeling brave?” he asked before we took off from a grass strip at Rougham, an old wartime airfield close to Bury St Edmunds in Suffolk. Fortunately, no-one with a machine-gun was on hand to intercept before we landed at another wartime airfield at Seething, Norfolk. Tim’s base is a very well appointed airfield with a tarmac runway, several hangars including aircraft turntables and workshops where he and a colleague are building brand new aircraft. While there I spotted a somewhat sad-looking plane impounded by Customs following interception of a people smuggling operation. Then we flew back again using a compass device on his mobile phone. I think I might just about have been able to manage straight and level and keeping her on course. In fact I indulged in a little aerial photography. My next foray was to another grass strip airfield near a tiny village in Suffolk called Monewden (pronounced Monnydon) to see that wonderful old warbird the Tiger Moth, which had service right from the beginning of the last war. Mike Webster and his colleagues flew over from Cambridge for an open day – in fact there were two Tigers, but the bright yellow version became the star attraction for the crowd. Fascinating to see the props being swung for a start-up and the guys handing on wingtips to help with sharp turns on the ground prior to take-off. And for me, lots more inside info, for which I’m deeply indebted. THE GET OUTTA JAIL CARD? What’s if feel like? That’s the question constantly asked by The Ghost in Robert Harris’s splendid novel of the same name. His character is a ghost writer quizzing his celebrity subjects, trying to get them to talk. But the “what’s-it-feel-like” question is just as valid for an author to quiz his own character creations. This is the route to depth and authenticity. So, if one of my characters comes out of jail after a three-year stretch inside, what does the first glimpse of freedom feel like for him? My question to Gerald Erle Roper in Munich. And short of a loquacious ex-con to hand, I went off to Wormwood Scrubs to walk the ground and try to get inside the head of Roper as he leaves the prison gateway. He steps through the arch, looks at the notice threatening dire retribution for anyone assisting a prison escape, then stares at the roadway – traffic buzzing up and down, the Tube rattling away just beyond and all those people rushing about while wrapped up in their daily lives. Ordinary lives, so unlike his own. I won’t reprise the rest. It’s in the Munich novel. Suffice to say the details of the gateway, that iconic arch, have a fascinating history. Google it, you’ll be intrigued. THIS IS THE BOOK FOR YOU! This was my first time enjoying this author and really love the characters. Fast paced action that kept me wanting more. If you enjoy page-turning mysteries and thrillers with snappy dialogue, flawed characters, and a little cross-Atlantic humour then this is the book for you. A gripping read. Laws creates a scenario that seems eerily plausible in the chaotic run-up to Brexit. He takes us on a wild ride… a great storyteller who leaves us guessing right up to the last page.- Gillian M.
An American foreign correspondent gatecrashes the pre-war Munich Conference to protest against British Prime Minister Neville Chamberlain’s surrender to Hitler – more than 70 years later it’s like the incident never happened – hushed up, with the man disappeared, never to be seen again. Now his granddaughter, a history graduate from Cambridge, sets out to discover what really happened.